Eppstein Wine Diary: Day 2 – What Becomes of My Scathing British Satire Now that I’m German? Some people have suggested that because I recently gained German Citizenship I’m now no longer British and that I will therefore lose my British humour, if I haven’t done so already. This deserves an answer and a satirical one at that! You see, satire isn’t just the heart of British humour, but also an essential element of British character. So let’s start with the official announcement I have not given up my British citizenship nor do I intend to do so unless forced by the machinations of so-called politicians on the Island of Great Brexit. As far as British humour goes judge for yourself from the following. We all have a more or less clear idea of what satire is and realize that it in its full-blown, no-holds-barred form it is always scathing. However, that doesn’t alter the fact that even on the Island of Great Brexit it leaves a few poor souls, including those so-called politicians, stone cold while many others only warm to its charms on occasion. 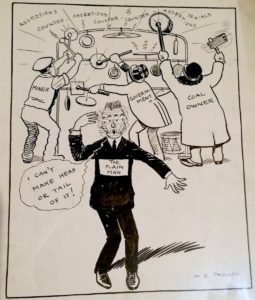 I always found it astonishing that scathing satire could sometimes fail to ignite the fuse of laughter, but clearly it’s possible to have a temperament ill-adjusted to this type of humour, or one that which easily mistakes incendiary satire for poisoned malice directed at the innocent. In fact, satire never attacks the common man as an individual, rather it burns those who, in one way or another, have pushed themselves into positions of importance and/or the limelight, who’s faces, words and actions are part of public life and well exposed in the media. The movers and shakers of this world are the natural targets of satire, also because they’re easily recognizable to the audience. Their characteristics features, typical gestures and favourite phrases must be exaggerated by the satirist to achieve his goal of igniting laughter, but never so far that the likeness gets lost or he fails as a result of that. Satire cannot burn The Plain Man who live quietly next door, because nobody would recognize them except his neighbours resulting in a gaping chasm of silence where there should be ecstatic laughter. At the most he can serve as anonymous models for a satire of a group, e.g. social class, political party, etc. to which they belong, but then his identity is lost in that crowd. Satire cannot hit him anywhere near as it easily does the leaders of such groups. The whole point of satire is that it should unmask the true character and intentions of the powerful, wealthy, self-important and would-be saints who don’t measure up to their own standards. It’s enemies are greed, arrogance, vanity and all other gross forms of human weakness in public life and the media. For its targets satire is always a double-edged sword, for it exposes them for what they are, but on the other hand by doing so it flatters them with its attention, thereby increases their fame and/or infamy. However, all this only functions if the satirist’s words, images, gestures, etc. connect directly with an audience. If the incendiary which the satirist has carefully prepared and ignited sets their minds on fire, then he succeeds. Some of them may feel rudely ripped out of their normal state of mind by the satirical work and laugh hesitantly, but others will see their own thoughts confirmed and magnified by the satirical work and laugh boldly. If these reactions are contagious, then a wildfire of laughter results and all hell is let loose! The kind of laughter has a cleansing effect upon our minds in the way that a big gust of wind that blows away all the dust that’s built up in the back yard. It helps us overcome the adverse effect upon us of those movers and shakers have on us, and through the laughter it unleashes it enables to at least temporarily throw off some of the general fear and loathing that the work-a-day-world induces. Thankfully, realizing all this won’t defuse the effect of the next piece of satire you encounter, just as an explanation of why something is sexually exciting doesn’t undermine that reaction next time around. The final essential quality of satire is that although in the strictest and most literal sense of the word the story it tells is not true, in a more fundamental sense it is totally true. That’s one reason why the illustration to these lines is one of the most famous satirical cartoons of James Gilray (1756/7–1815). 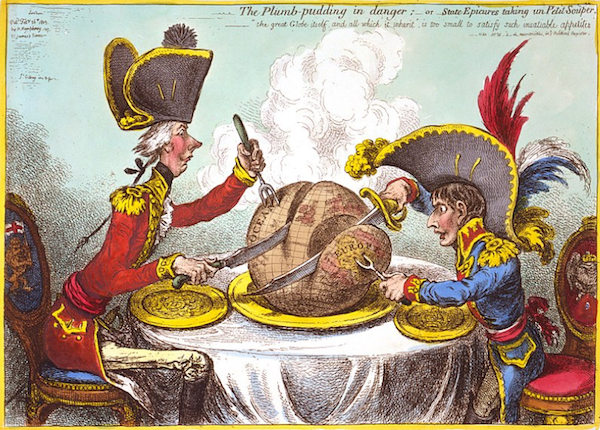 It shows William Pitt, the British prime minister of the time sitting at the dinner table with Napoleon Bonaparte of France where they are carving up the world as if it was a plum (Christmas) pudding. Of course, this pair never actually did that, but what the cartoon says to us about the two leaders is brutally true. No wonder this cartoon unleashed a wild fire of laughter when it appeared in 1805, even if some laughed behind raised hands, while others denounced it as disrespectful to one or both leaders. Of course, they were right that the cartoon was totally outrageous! The other reason for using this image is that it belongs to the great tradition of British satire. 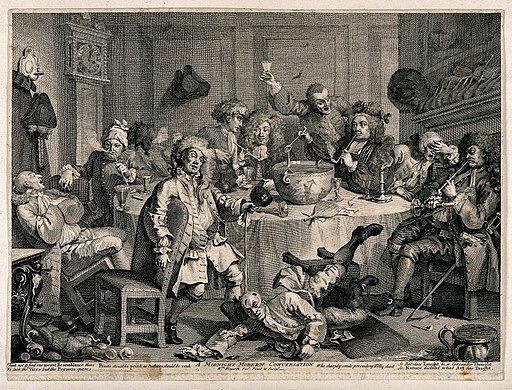 That begins properly with the writer Jonathan Swift (1667–1745) and the engraver and painter William Hogarth (1697–1764, his A Drunken Party is pictured above), however, it’s backstory is the explosion of political and other pamphlets published during the Civil War of the 1640s when royal censorship was effectively suspended. British satire went on to reach it’s next high point with Gilray and his colleagues Thomas Rowlandson (1750–1827) and George Cruikshank (1792–1878). I hope those illustrious and notorious gentlemen would appreciate these thoughts if they could read them, although mine is no pure form of British satire. Both Berlin and New York have influenced the way I write in this vein. If you wish to call the result a hybrid, then you are welcome to do so. Satire, including my own, invites and revels in satirical responses! Of course, satire can hurt those who are its targets, but mostly it does that because it is the bringer of painful truths. Who has never been shocked by unexpectedly seeing themselves in the mirror? One such moment is the climax of “The Kentucky Derby Is Decadent and Depraved” by Hunter S. Thompson (first published in Scanlan’s in June 1970), one of the great works of modern satire in the American language. What makes this story innovative is that there’s a lot of precise factual reporting in it, but in the end you can’t tell where reality ends and satirical exaggeration begins. Remarkably those real things don’t prevent the satirical incendiary from igniting a wildfire of laughter. In fact, at the end the joke literally blows up in Thompson’s face! That inspired my own recent satirical writings. Satire is always a wake up call, even if the satirist knows in his heart that their work won’t change the world. I think that acceptance of this is part of the mature satirical state of mind. It doesn’t alter the fact that we urgently need to laugh at the “great” of this world in order to be free of their noxious influence upon our minds and hearts. That’s when scathing satire is at its best, be it British, of another nationality or a hybrid of two or more nationalities as my own is.